For several years, Activate has been engaged in the student residence sector, building up a wealth of expertise particular to this building typology. 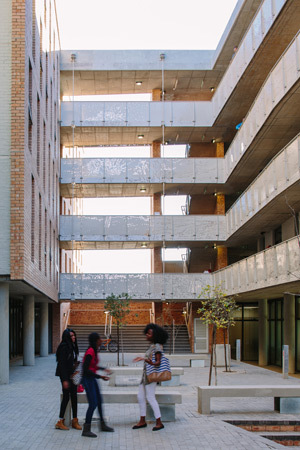 Three recent projects are for Sol Plaatje University (SPU) in Kimberley, and Kopano House at the University of Johannesburg. For Activate, the starting point is to view the student res as a holistic learning space that needs to be healthy and supportive. To support learning, spaces need to be physically safe and comfortable, and students need to feel at home within a community. This needs to be accomplished within the primary economic driver of the project – namely, to fit in as many beds as possible. Nhlamulo Ngobeni, project architect on UJ’s Kopano House, adds, “Our model tries to create sociable spaces, like a family away from home. 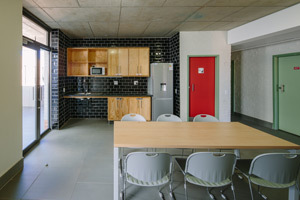 At the Kopano refurbishment, all the communal spaces were previously located on the ground floor, which effectively disconnected the students from the more social aspects of living. We have included two seminar spaces per floor, which are study spaces overlooking the reinstated courtyard that are big enough for small lectures or group discussions. We imagine that these spaces could be retrofitted as library areas or computer labs, thus equipping the res with different functions. “We invited the head of Student Affairs and members of the SRC (Student Representative Council) to be part of the design process and report back to their peers. We knew that the existing building performed poorly in terms of thermal insulation as it had large, single-glazed windows and no roofing insulation. Each room also had two openable windows with a dividing panel. Students were using heaters, which consume a lot of energy. And they often kept the hot water running in the bathrooms to heat up the spaces, which damaged the walls of the bathrooms and had a big impact on both water and energy consumption. Van der Wiel, project architect on the SPU residences, explains that Activate’s commitment to high performance architecture includes responding to tight budgets with design interventions that achieve multiple results simultaneously. 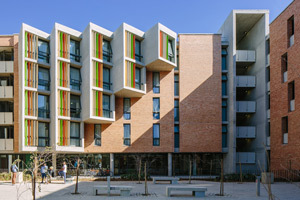 The first SPU residence is arranged in the form of apartments with six to eight individual bedroom sharing ablutions, a living area and a kitchenette. Accommodating 350 students over 11,000sqm, the spatial layout was designed with informal connection spaces inviting students to interact with each other, to foster a sense of belonging and identity. In Kimberley’s extreme climate, thermal comfort was a priority. For this res, the aim was to maximise the number of north-facing rooms, and proportion windows for maximum daylight and sunlight in winter. Thermally Activated Building System (TABS) principles were applied by using the building structure for thermal energy storage. The envelope was highly insulated, and water pipes were looped into the concrete floor slabs, through which warm water is piped in winter, and cool water in summer. With no ceilings and a large structural mass, a very stable internal temperature is created, and very little energy is required to overcome peaks and drops in temperature. The second res, a recently completed refurbishment, had an existing shell which was sensible from a thermal performance perspective. Little kitchens were added at the end of each passage; and acoustic wall panels were incorporated to soften the visual material quality and improve the auditory comfort of the spaces. In addition, the drab 1960’s tones were livened up with brighter colours to improve the character of the interiors. With a holistic approach to design and operations that addresses both return on investment for the building owners and quality of life for the students, Activate has developed a winning formula for both new and refurbished student residences.